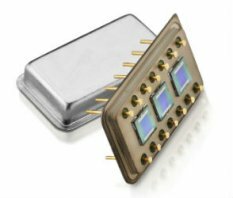 Specialty IR Sources are wire wound supported filament emitters that have stable properties and long life. This infrared thermocouple system (IR-12/TC and IR-12K/TC) consists of a standard IR-12 or IR-12K infrared source, a Type K thermocouple and an optional digital thermometer (IR-DT). These units have been used as checks on infrared instruments such as thermometers and cameras. When power is applied to the infrared source the unit heats and the digital thermometer generates a digital read out of the surface temperature. The thermocouple output can also be used as an input to the power supply system to control the source temperature. The Type K thermocouple sensor is fabricated using special limit error thermocouple wire. The wire is rated at ±1.1°C. However the connection between the thermocouple and the IR source causes the difference in readings (about 50° C). The system is designed for tracking the thermal stability of a source. The sensor is applied directly to the coil of the infrared source. High temperature, low-expansion material is used to apply the sensor. 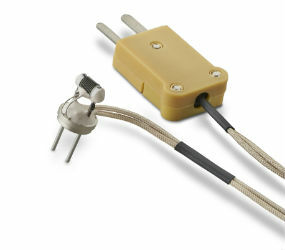 The thermocouple is terminated with a standard Type K ANSI miniature plug. The thermocouple system can be plugged directly into the digital thermometer. The thermometer also accepts all other Type K thermocouple probes with ANSI mini connectors. Our parabolic and elliptical reflectors can be used with the Thermocouple Systems.